In order to provide electricity in more unserviced areas, listed energy firm Vivant Corporation (VVT) is developing renewable hybrid power projects in different parts of the country. These power projects, which aim to use more renewable energy sources than its traditional fossil fuel components, are part of Cebu-based VVT’s bid to strengthen its position in the off-grid SPUG (Small Power Utilities Group) market. “The off-grid SPUG market continues to be a priority growth area for Vivant. By investing in projects like these, we fulfill our commitment to contribute to the inclusive growth of Filipino communities around the country,” said VVT Executive Vice President and Chief Operating Officer Arlo Sarmiento. The company is earmarking investments of P3.3 billion between 2018 and 2020 for different projects, not just in the Visayas but also in Luzon and Mindanao. Among these projects is the 2.68-megawatt (MW) Sabang Renewable Energy Corp. (SREC) in Puerto Princesa, Palawan, where the Underground River, regarded as one of the new seven wonders of nature, is located. SREC is a renewable hybrid power plant with a micro-grid component and is expected to be completed next year, 2019. VVT has 30 percent equity on this project. It would use solar and diesel sources and will have batteries for storage. “This is a pilot project for us. If it works, we can use the model to other parts of the country that are not connected to the grid,” Sarmiento told reporters at the sidelines of VVT’s annual stockholders’ meeting yesterday morning at the Montebello Villa Hotel. The company is also investing in a 6.07-MW renewable hybrid project named Culion Renewable Energy Corp. (CREC). It will be contracted to the Busuanga Island Electric Cooperative (BISELCO) in Culion and Linapacan in northern Palawan. This renewable hybrid project will be composed of 3-MW solar and 3-MW diesel, plus batteries to store energy for evening use. Sarmiento explained that these renewable hybrid projects are designed to maximize the usage of renewable energy, in this case solar. Only when the solar component is not enough that they use power generated by its diesel component. He added the company is eyeing to replicate this kind of projects in other parts of the Visayas, including Cebu, and near Palawan. For now, he said these areas are strategic locations for their expansion plans as they already have existing projects here. Another project by VVT is a 670-MW coal-fired power plant in La Union. The Global Luzon Energy Development Corp. is still at the pre-development stage. 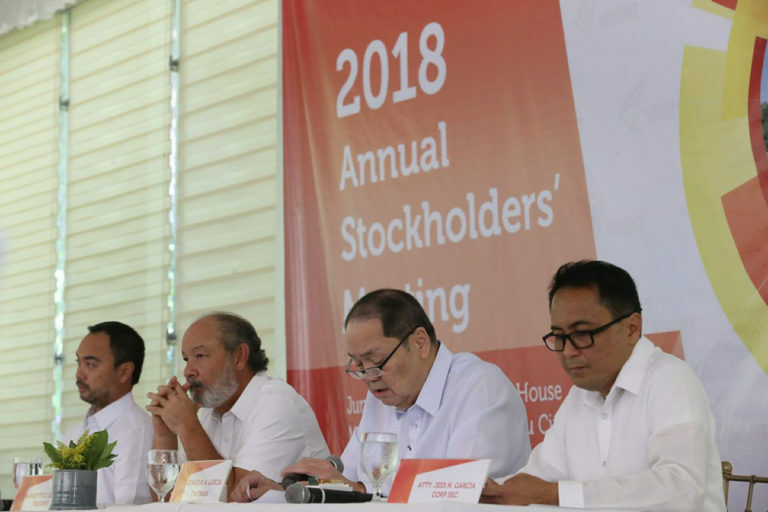 In his report at the stockholders’ meeting, Sarmiento revealed that the company recorded a “steady” net income of P1.26 billion for the entire year 2017 compared to the P1.29 billion they posted in 2016. “Vivant’s earnings were buoyed by the income contribution of the distribution business and the fresh contributions of generation projects stemming from investments made in prior years,” he said in his speech. Sarmiento explained that these were able to offset the adverse effects of the expiration of the income tax holiday of an affiliate as well as incremental costs, among other reasons. VVT is a company listed in the Philippine Stock Exchange. It has investments in energy distribution, generation, and retail electricity supply. Through its equity interests in subsidiaries and associates, VVT provides services in Luzon, Visayas and Mindanao.